Penrith have lost their first game at Panthers Stadium this year with a disappointing 18-10 defeat at the hands of Manly this afternoon. The Panthers took an 8-6 lead into the break but went tryless in the second half with the Sea Eagles doing enough in a scrappy game to secure the two competition points. “It wasn’t very good,” Panthers coach Anthony Griffin said. Griffin refused to blame the representative period for the loss. “You could make a lot of excuses but everyone is going through it at the moment,” he said. 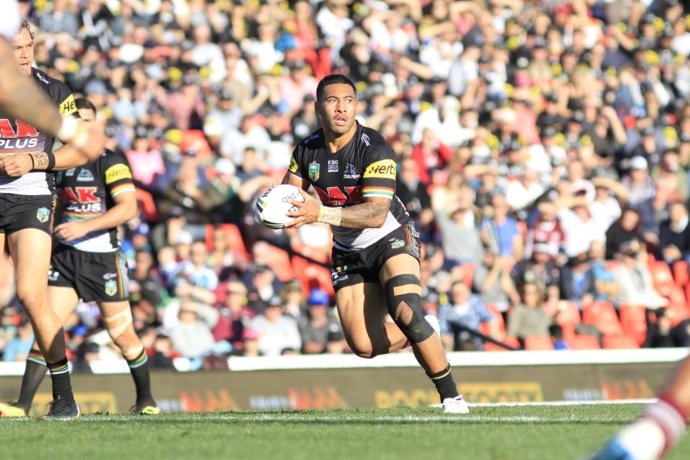 Dallin Watene-Zelezniak scored Penrith’s only try of the game in the first half. The side didn’t look likely to score again apart from a short period mid-way through the second half, but couldn’t capitalise on their opportunities. In some good news for the Panthers, it appears Viliame Kikau has not suffered a serious knee injury after leaving the field in pain late in the game. It’s understood to be a serious cork. The Panthers are back at home on Friday night to take on the Warriors but will be without Nathan Cleary, James Maloney and Tyrone Peachey due to Origin commitments.